Do You Know These Thieves? On October 25, 1010, at 12:42 p.m., Sacramento County Sheriff’s Department deputies responded to the Thomas Edison Elementary School at 1500 Dom Way to take a theft report. Two teachers reported their wallets had been stolen from their purses while they were out of their classrooms. The school’s video surveillance cameras captured images (see photos/video below) of the suspects as they walked on the campus at the time of the thefts. Detectives learned during their follow up investigation the same two suspects, on the same day, just minutes after the thefts occurred at the school, were identified as suspects using credit cards stolen from the school at a nearby drug store. 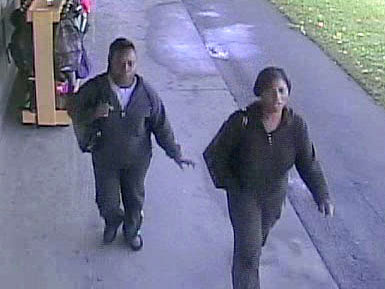 The suspects are described as Black female adults, 25 to 35-years old, 5’5” to 5’8” tall, with medium builds. Suspect 1 had her hair pulled back in a pony tail. Suspect 2 had short black hair. The two suspects were confronted by the drug store’s loss-prevention officer who saw them drive away in a full-size blue Ford Econoline van. Detectives believe these suspects may be tied to other similar theft cases they are investigating. Anyone who knows the identities, or whereabouts, of these two thieves is urged to call the Sacramento County Sheriff’s Department at (916) 874-5115, or Crime Alert at (916) 443-HELP. Tipsters may also send a text message tip by texting to 274637 (CRIMES) then enter SACTIP followed by the tip information. Callers can remain anonymous and may be eligible for a reward of up to $1,000. No Comment to " Do You Know These Thieves? "